The biomechanical study found that the Acutrak fully threaded headless compression screw with continuously variable thread pitch is potentially favorable over partially threaded cancellous screws for the compression of medial malleolus fractures. A recent study published in the Journal of Clinical Biomechanics compared Acutrak 2–4.7 mm headless compression screws and 4.0 mm partially threaded cancellous screws and found Acutrak was the potentially favorable option for the fixation of medial malleolus fractures. The investigator-initiated biomechanical study was led by Robin Z. Cheng of the University of California Davis Medical Center. Additional contributors were from UC Davis and the Stanford University School of Medicine. The principal investigator of the study was Derek F. Amanatullah, MD, PhD of Stanford. The work was funded in part by Acumed. It is important to note that synthetic tibiae were used in this study rather than cadaveric bone. The Acutrak 2 screws, however, were noted by the authors as having a larger diameter, which would engage more bone than the 4.0 mm screws and potentially result in lower bone and screw stress. 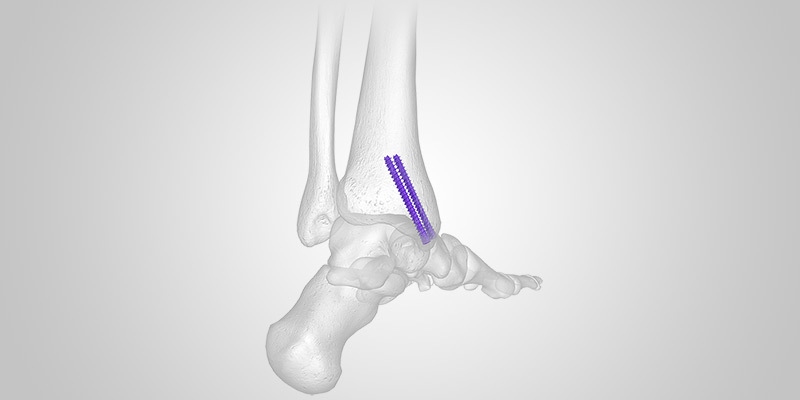 medial malleolus fractures. Clin Biomech. 2018;55:1–6.